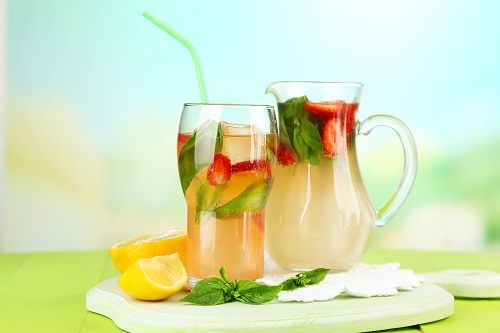 You will need 2 to 3 basil leaves and some more for garnish, 2 to 3 strawberries, 1 ounce vodka, and fresh lemonade. Crush 2 to 3 strawberries in a glass, then add basil leaves and bruise gently. Add lemonade and vodka, stir, then add ice and garnish with some basil leaves. Sip on this 130-calorie cocktail while you lounge at the pool or after a long, hot day!